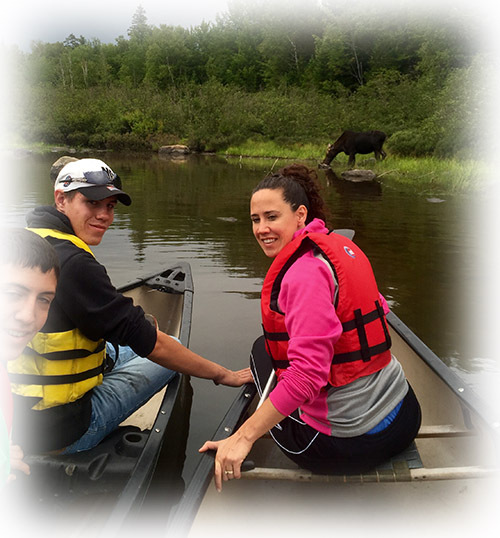 Why to choose Northwoods Outfitters for your Moose Safari Tour? "Our guided Moose Safari Tour with Mark exceeded our expectations! We never thought we could get that close to a Maine Moose and our pictures came out incredible. It's all our kids talk about and was certainly the high point of our vacation!" Experience the feeling of your Canoe or Kayak slicing effortless through waters surface on a remote pond graced by the majestic and historic mountains that form the Appalachian Trail. 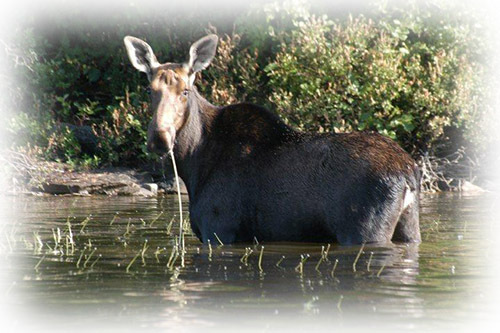 On your trip you may see trout jumping, families of loons and ducks, Beaver, Otter, Whitetail deer, Snowshoe Hare, Bobcat, Black Bear and of course, the Majestic Maine Moose! 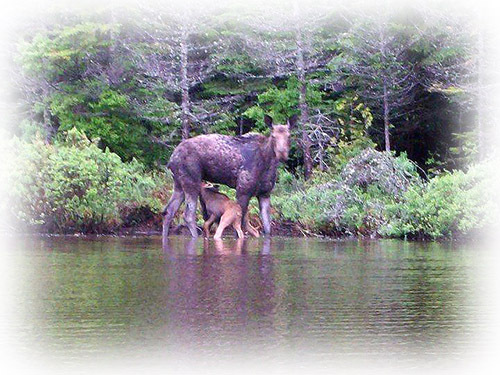 Your personal moose safari will be led by an experienced and knowledgeable registered Maine Guide from the Staff of Northwoods Outfitters, Maine's premier outdoor outfitter. 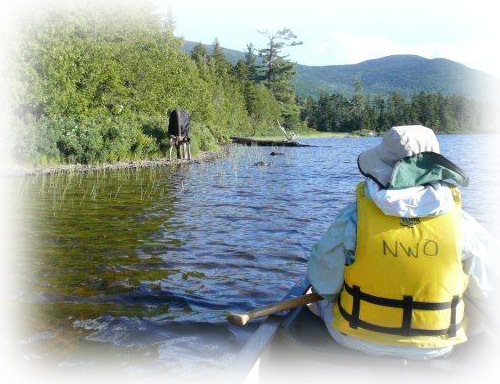 Our guides have a passion for the Maine wilderness and are well rounded naturalists. 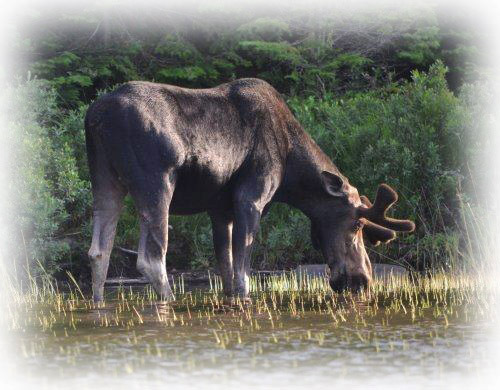 In addition to seeing and learning about Moose and other wildlife, you will also learn some of the interesting history that makes the Moosehead Lake region truly unique. If you’re looking for a exclusive and memorable wilderness experience, far from the noise of cars, free from the whine of motorboats, with only the lonely cry of the Loon, then let us take you there. Get out! With Northwoods Outfitters. Age: All ages, private trips available for families with children under 10. This guided interpretive nature tour consists of great scenery, Moose and wildlife watching, infused with local history and lore. 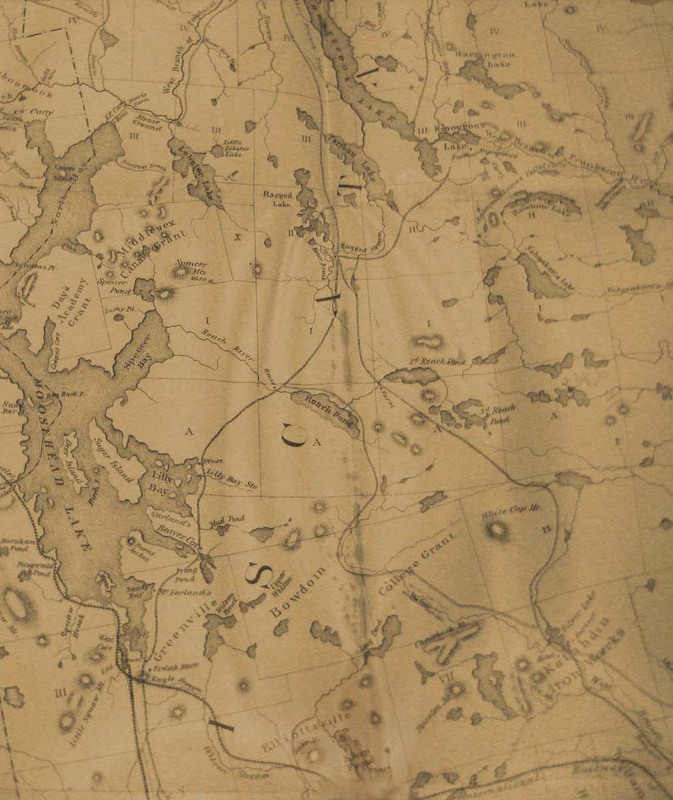 The Moosehead Lake region’s backcountry can be a bit overwhelming to the visitor with its vast road network and thousands of acres of undeveloped lands. With a Registered Maine Guide leading the tour you don’t have to worry about which road you’re on or if you should have made that last turn. You can sit back, enjoy the scenery and enjoy your guides company. But stay alert, Maine Moose and other wildlife frequently this area and can present themselves any moment so join in on the search! From scenic mountain vistas to secret moose hangouts this trip has it all. Looking for a more customized moose watching experience? Commission one of our experienced guides to lead you or your group on a private moose safari. 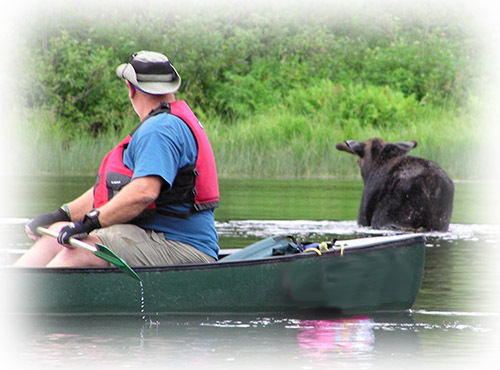 Experience the thrill of seeing the majestic Maine moose in a more intimate setting. Fewer people means more chances to see the Maine moose, and see it closer. Many professional photographer's commission this trip to catch their prize-winning moose photos. for your Moose Wildlife Safari? Experienced guides- Friendly, courteous, and knowledgeable. Our guides are some of the best in the state and they know where to find the elusive Maine Moose! On our guided moose watching tours we count well over 1000 moose sightings annually. Professional photographers hire us to find them moose photo opportunities. We have been commercially guiding moose watching tours for over 10 years. We have guided over 5000 satisfied clients for moose watches. The Moosehead Lake region supports some of the densest moose population in the country. Our tours have been mentioned on many TV and press just a few are, ABC, CBS, PBS, The Boston Globe, Outside magazine, Metro Sports magazine, The London times, The wall street journal, The New York times and many more.